I have a few different kinds of battery charger and for some reasons I am still looking for more. I have different kinds and different style, yet I still couldn't settle for one. I used my phone or my iPad often, especially when we go travelling. For my son it's a way of his entertainment whenever we have a long road trip. There is a battery charger in the car, but sometimes we use the outlet one for the GPS and the other is for my other car charger. So the more external battery charger I have, the more source of power I would provide for our devices. 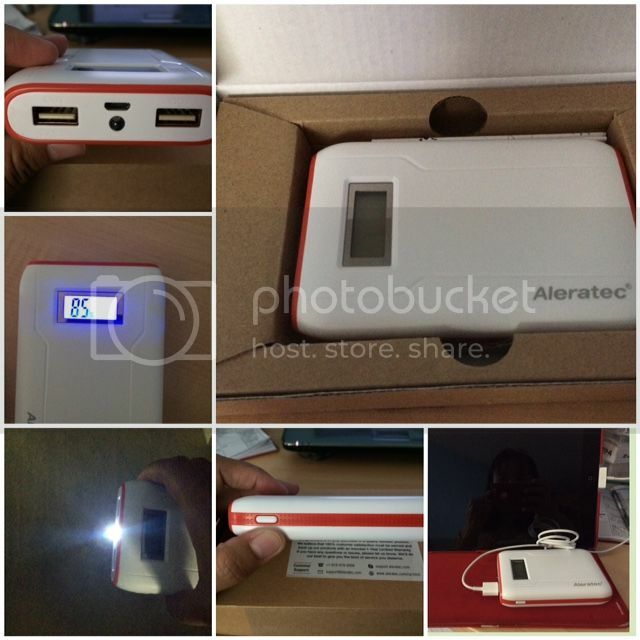 Anyways, I have the opportunity to receive an 8000mah External Battery Charger from Aleratec company. I have to say I just recently heard about this company that's why I am very eager to try and test and even learn about the company's products. The product arrives in the mail via UPS. I like how secure and the way they pack the item. Aside from the shipping box the protected packaging box they have to store the merchandise possess a positive vibe towards their customer. I don't see any signs of damage to the product that I was able to use it right away. I like the idea of having at least 44% charge so I would be able to charge my iPad2 immediately. That's one point, I don't need to wait to charge the external battery charger because it is drained. In the box was the External Battery Charger, the cable and the manual. It has 2 USB ports [2.1A or 1A] so I can either any of the ports or I can charge 2 devices at the same time. I love the idea of the flashlight, something I have never seen in a different charger. Very awesome product it has a dual purpose for me. I like the anti-grip feature, like me, who is always in a rush because of my naughty yet adorable kids, sometimes things just slip out of my hands. I like the digital display which tells me what port have I used as well as it shows the percentage power of the charger. The manual that was provided is indeed very helpful, you should read it for more simple instruction about the product. Not bad. We have a lot of portable chargers laying around and most of them are useless. You got some cool chargers! This one sounds very effective and will last long. Ang cute ng design, and yes very handy rin to have this external battery charger. We need it in our home. Looks sturdy, something I am needing these days for my Ipad and 2 phones. Too bad, it doesn't come cheap.